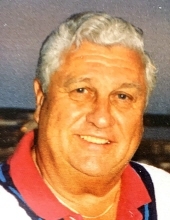 John H. Hastings of St. Clair Shores died peacefully February 8, 2019. He was 89 years old. John was born May 22, 1929 in Detroit, Michigan to Corinne Flattery and John P. Hastings. He attended University of Detroit High School and spent his entire career in packaging. He was the consummate salesman referred to as “The Old Detroiter”. John made everyone laugh and he loved his food. He was very generous with his time and was always a “sharp” dresser. John was a member of the Saturday Club and DAC. He loved spending his summers on the beach in Holland, Michigan and Caseville, Michigan. He also had a strong Catholic faith and was a long-term member of St. Bede’s Parish in Southfield. John is survived by his loving children Katherine Azar, Sandra (Kevin Frampton) Azar, Julie (Steve Bennett), Chris (Sue Rosasco), Mary Pattison, Patrick (Aura Deschamps) Hastings, and Karen (Ron DeRocher) Hastings. He is also survived by his beloved grandchildren, Lucas Hahn, Stephanie, Alexandra, and Nicholas Bennett, Katie Andrew, and Patrick Hastings, Timothy, Natalie, and Brian Pattison, and Amanda and Matthew Hastings. He is also survived by Rhoda and many cherished friends. John is preceded in death by his parents, John and Corrine Hastings and his brother, Tom Hastings. A Funeral Mass will be celebrated at St. John the Evangelist Catholic Church, 625 111th Avenue N., Naples, Florida, Saturday, February 16, 2019 at 12pm. Memorials appreciated to the Alzheimer’s Association, 25200 Telegraph Rd., Suite 100, Southfield, Michigan 48033. "Email Address" would like to share the life celebration of John H. Hastings. Click on the "link" to go to share a favorite memory or leave a condolence message for the family.